Combining patterns and clean shapes to craft wares that are a pleasure to both use and admire. 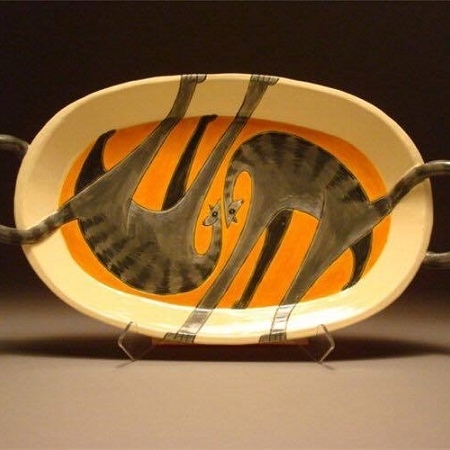 Wheel-thrown decorative and functional ceramics. Hand-built tiles and throw pots which are altered. Clay body is formulated for Raku firing. Wheel-thrown and hand-built stoneware and porcelain. Mostly functional fired to cone 6 and 10. Wheel-thrown and hand-built stoneware. Food safe & fired in a cone 6 electric or cone 10 gas kiln. All pottery is created either on the wheel or hand-built using traditional methods. All pieces are functional, meant for every day use and fit in the modern home. Wheel-thrown functional potteries with optional alteration and hand build. Functional ceramics that tell stories using textiles and plants on clay. Hand-built, one-of-a-kind pieces that explore what common objects mean to us. Elegant functional pottery for the discerning pottery lover.